We had never heard so-called experimental music at the time, we didn't know that people made music with textures and pure sound. So we started doing that ourselves in high school, walls of drones with guitars and delay pedals and us screaming into mics. ... everything since then has been a variation of what we explored that summer. Dave and I had already made the Spirit They're Gone record, but during the summer we really cracked the egg open. It seemed like we could go anywhere we wanted after that. Released as the first single from Merriweather Post Pavilion, "My Girls" was later voted the 248th greatest song of all time by NME. ^ "animal collective "hollinndagain" press page". www.paw-tracks.com. Retrieved July 25, 2017. ^ "Animal Collective: Sung Tongs Album Review | Pitchfork". pitchfork.com. Retrieved July 25, 2017. ^ "Animal Collective Concert Setlists (page 57)". setlist.fm. Retrieved November 25, 2018. ^ "Animal Collective: People EP Album Review | Pitchfork". pitchfork.com. Retrieved July 25, 2017. ^ "Deakin Re-Joins Animal Collective". Clash Magazine. Retrieved July 25, 2017. ^ "Animal Collective to Release "Brothersport" Single | Pitchfork". pitchfork.com. Retrieved July 25, 2017. 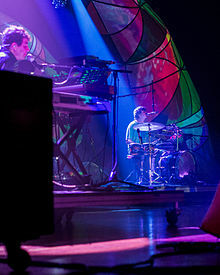 ^ "Animal Collective Release Live Album 'Live at 9:30'". Spin. September 1, 2015. Retrieved July 25, 2017. ^ Gordon, Jeremy (January 4, 2016). "Animal Collective's Primitive Future - Interview". pitchfork.com. Retrieved August 13, 2016. ^ Kevin Lozano (November 17, 2016). "Listen to Animal Collective's Unreleased "Red Dead Redemption" Song "Mountain Game"". Pitchfork.com. Retrieved July 22, 2017. ^ Matthew Strauss (February 13, 2017). "Animal Collective's New Song Is "Kinda Bonkers": Listen". Pitchfork.com. Retrieved July 22, 2017. ^ "Domino USA | News | Animal Collective announce 'The Painters EP'; watch the 'Kinda Bonkers' lyric video". Dominorecordco.us. Retrieved July 22, 2017. ^ "Instagram". Instagram. March 21, 2017. Retrieved July 22, 2017. ^ Sam Sodomsky (March 21, 2017). "Animal Collective Announce New Live EP Meeting of the Waters". Pitchfork.com. Retrieved July 22, 2017. ^ "Animal Collective Announce Sung Tongs Tour | Pitchfork". pitchfork.com. Retrieved March 19, 2018. 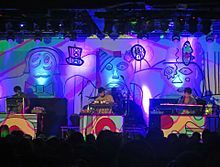 ^ "Watch Animal Collective Perform New Music in New Orleans | Pitchfork". pitchfork.com. Retrieved March 19, 2018. 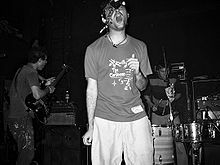 Wikimedia Commons has media related to Animal Collective.